Rockstar GamesLife is slower on the range. 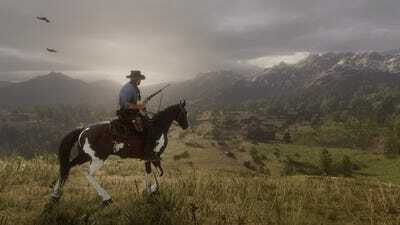 On Friday, the much-anticipated “Red Dead Redemption 2” launched. The game is massive – it takes over 60 hours to complete the story. That massive scale also means a massive file size: from 90 to a little over 100 GB, depending on the version. And that can mean lengthy download times, making some folks pretty upset. The biggest game of 2018 is finally here: “Red Dead Redemption 2” is available now on Xbox One and PlayStation 4. But that doesn’t mean you can play it immediately. This is 2018, after all, so you have to deal with a pretty hefty download and/or file install on both PlayStation 4 and Xbox One. If you buy the game digitally, you’re looking at somewhere from 93 to 107 GB, depending on your console of choice. And that has people freaking the hell out as they wait for the massive download to complete. Waiting for the 93 gb download of Red Dead Redemption 2 to complete, I googled how big GTA 1 was. 80 mb it turns out. That's 0.08% of the size. There are, of course, ways around dealing with these massive file sizes. You could, for instance, buy a physical copy of the game – it will still take some time to install, but not nearly as much as a 90 GB file takes to download. And there’s one other option for you digital-only folks: set the game to start downloading remotely on your console while you’re at work/school/etc. You can easily set that up through your console’s settings. Connect your console directly to your router via Ethernet cable – it should go faster than wireless. Put your console in sleep or rest mode and stop looking at the download. A watched pot never boils, you know! Make a really tasty sandwich and eat it. Who doesn’t like sandwiches?! Re-read our review to amp up your hype levels.